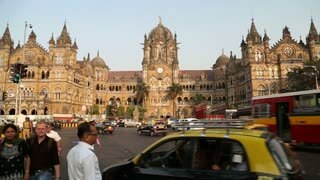 MUMBAI, INDIA - 17 JANUARY 2015: View on Chhatrapati Shivaji Terminus, train terminal in Mumbai. A shearwater mutton bird dries its wet feathers on a beach in Victoria Australia. Cattle truck coming into farm at sunrise to load cattle for export at Portland, Victoria Australia - Feb 3, 2017. View over Belfast looking toward the south and west with the Albert Memorial Clock Victoria Square Shopping Center and other buildings.